The FPGA circuit design fixes the timing issues associated with the OEM design which was due in large part to the IC count and board layout. Utilizing this FPGA technology, we have added additional test features which will allow the end user to verify that this board is functioning as designed and providing an independent method of testing the dot matrix display outside of the game software, helping the end user to determine if a bad display is a bad display and not some other component in the game. 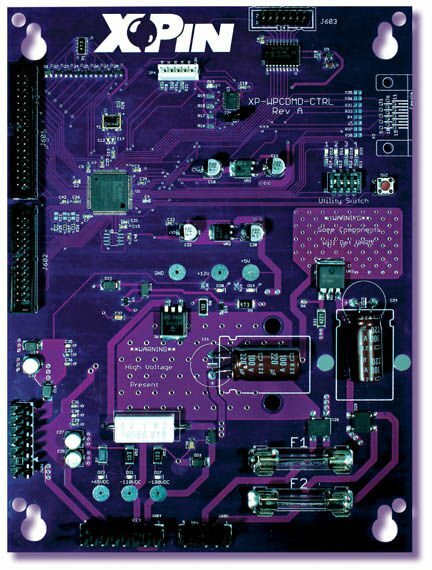 The FPGA circuit design also allows for an increased scan rate, which is needed for LED based dot matrix displays. Original OEM Plasma DMD’s, due to their technology, have an effect called persistence. Persistence is the time it takes to go from an ON state to an OFF state. Persistence in the OEM display’s lasts ~1/1000 of a second. The persistence of an LED is significantly less then this. The increased scan rate allows for the LED to stay on for a longer period of time and reduces the strobing effects associated with LED technology. A redesigned High Voltage section provides a solid foundation for the operation of the OEM High Voltage Plasma Dot displays. Centralized test points allow for easy voltage measurements. Though it is not necessary to change your OEM Plasma Display to work with our new XPin™ XP-WPCDMD-CTRL Controller, you can upgrade your old plasma display to our new XPin™ XP-DMD4096 LED DMD, in your choice of Orange & White. The white display ships with Red, Green & Blue colored vinyl gels to get that color you need. Additional colored gels are available for customization. Re-Engineered High Voltage section, eliminating shortcomings in the original OEM design. Debug system independent from the original game firmware. Allows the user to verify the functionality of the Controller and dot matrix Display independent from the game MPU and Firmware. Multi-rate Scanning. Research has shown that different games and even different firmware revisions for the same game can have slightly different scan rates. XPin™ has developed a system to adjust the scan-rate of the dot matrix display to reduce the flicker that is often times visible in OEM plasma displays and LED dot matrix displays. Increasing the scan rate allows for smoother animations. This multi-rate scanning is part of our Patent Pending LightWave Technology.